The pink and cream star quilt top is finished. Has been, in fact, for a while but we had to wait for a day that wasn’t too windy to get a good shot on the roof garden. It’s approximately 60″ by 80″. The start is the red and white stars quilt that will be the same as the quilt in my blog header. I learned last week that cutting out fabric with scissors is a huge kitten attraction. So Friday I got all the pieces for the top cut by rotary cutter. Otherwise, it would probably have taken me a month to try to cut out all the pieces. 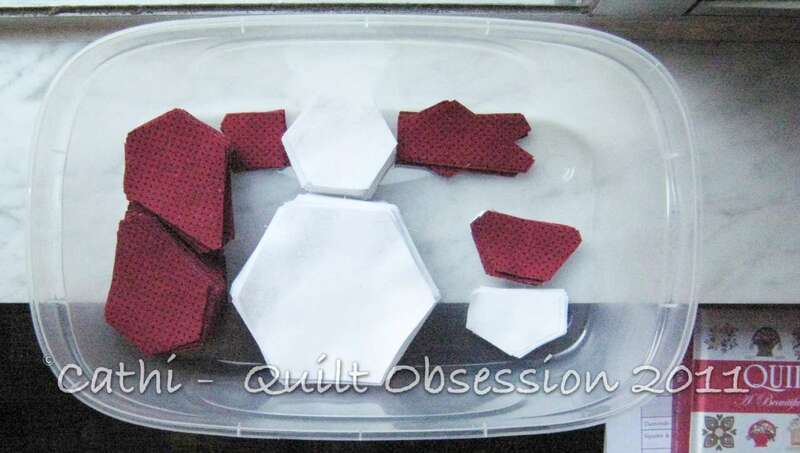 Having all the pieces cut and ready to stitch is very tempting. That said, I’m working on the Summer Dresden Plates almost exclusively. It’s going to be a pretty, summery quilt and I want to finish it before the summer is over so that I can get a good shot of it out on the roof garden. The blocks for the centre are done. Today the blocks will be up on the design wall so I can arrange and rearrange them and get them sewn together. The first border is already planned out. The question? In conversations with a friend lately, the question came up about what was the preferred size of quilts to make. I seem to prefer making lap quilts for the most part. That may be because we use a duvet rather than quilts on the bed. What size quilts do you prefer to make? When you look at patterns, are you more attracted to those that give you the instructions for various sizes? It’s very hot and humid here. I don’t think we’ve got smog alerts yet, but with this kind of weather they’re sure to happen. It almost feels like you’re walking into a wall of heat when you go outside. I’m not complaining, as this is by far preferable to winter temperatures. Baxter discovered the windowsill on the weekend. Has Baxter discovered the birds outside the window yet? Your pink and cream star top is lovely! I like making smaller quilts and projects, although I have a couple of very large tops waiting to be quilted…..one day………. Hehehe… yes, scissors are definitely a kitty attraction. You certainly don’t want any paws caught in the scissors, ouch! 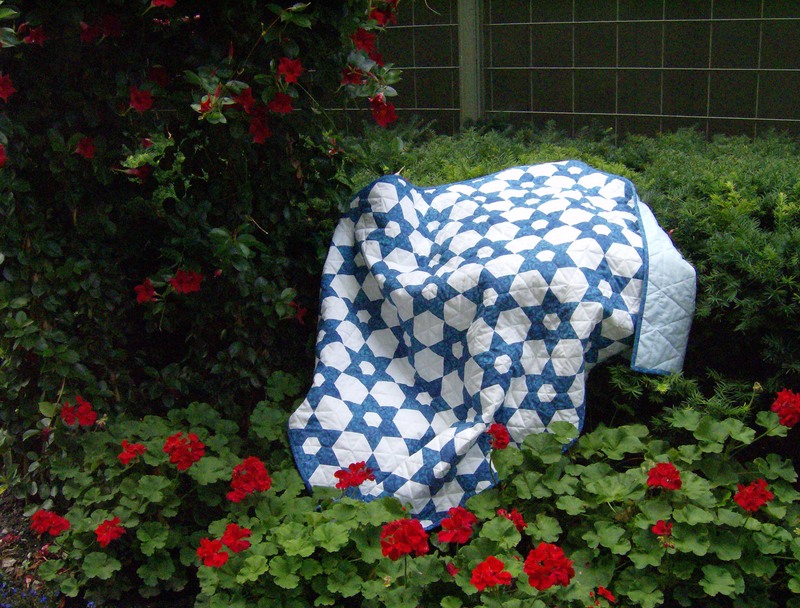 I tend to make larger quilts, because we do use them on the beds. Although lap size are quite useful for snuggling under in the winter while watching a TV show. But then, I tend to make mine a twin size in place of a lap size because you can really wrap yourself in them. By the way, your quilt came out beautifully! The pink and cream star quilt is beautiful! We also have duvets on the bed, so no quilts. I prefer to make lap size quilts, cause they can be used on the couch and are achievable to quilt myself. The lollypop tree quilt was too big for my appetite, so I downsized the blocks and the appliqué shapes, though it will be a huge quilt after all. I can always decide to make less blocks. We‘ll see. I’m developing a dislike towards all those huge 12″ quilt blocks and start to love handpiecing and smaller blocks more and more. Hi Baxter, are you watching the birds? I LOVE your star quilt! What an excellent quilt! I tend to like lap quilts also because they are great for a coverup on the sofa or a chair and they are quicker to make of course. then on to the next project! At this point I would just like to get something made for myself! 🙂 I can’t wait to see the dresden summer quilt done! Baxter will soon fill up the whole ledge, his tail looks as long as his little body! So cute! 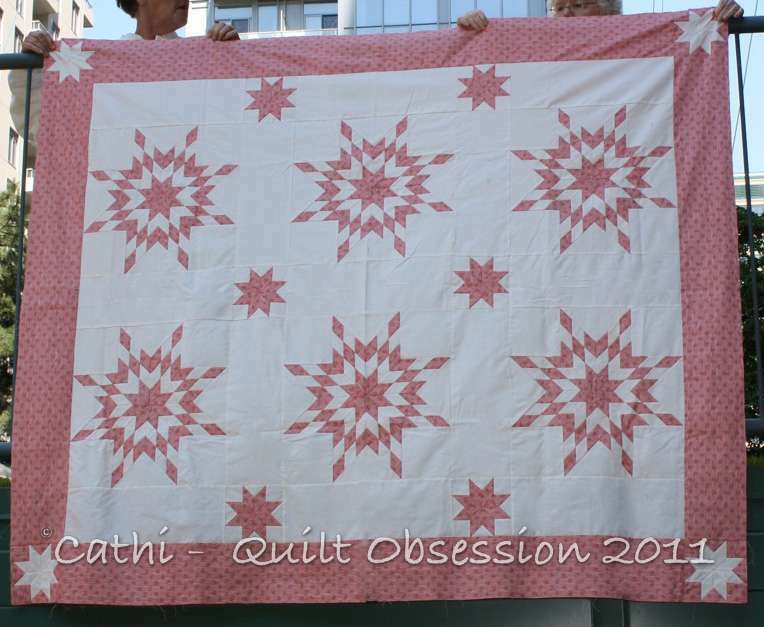 The pink and cream quilt is wonderful Cathi!! It’s amazing you get any sewing done with all the help Baxter loves to give you LOL. 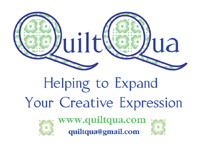 I like big quilts because we use them on the be–, the smaller quilts I do not use so much but they are a size that I occasionally sell so I always make a few of them too. Your pink and cream star quilt is beautiful. I’m also looking forward to seeing your Dresden one when it’s finished. As for quilt sizes, I make all kinds. But I’ve been really focused on gathering fabrics for several king-size quilts lately to make for our bed. Although I can usually re-size a pattern to whatever I need, I do appreciate it when the work is already done for me and included with it. I still miss seeing Smudge and Lester, and I’m enjoying seeing Baxter grow by the day. Almost as much as I love seeing your wonderful, inspiring work. Your pink and cream quilt is beautiful. Baxter is just so cute. I love that you post pictures of him daily. It is like watching him grown up. I usually go for a large size that will cover the queen bed and tuck in at the bottom. Larry says why make it if it’s smaller? So, I make it fit the bed. But, If I’m making a baby quilt, I follow my Momma’s example of basically width of fabric by 60 inches-why? My daughter grabbed up that quilt for years to come, long past baby stage. It let’s the child grow into it that way… Baxter’s a cutie! Baxter is so cute…love his ears! The quilt is gorgeous! lol…. Adore your quilt. I’m a sucker for Star quilts. My very fav. Quilt sizes – I hardly ever make a huge quilt. Dont know why. I guess I hardly ever use a pattern and my quilts just evolve to the size that seems right. 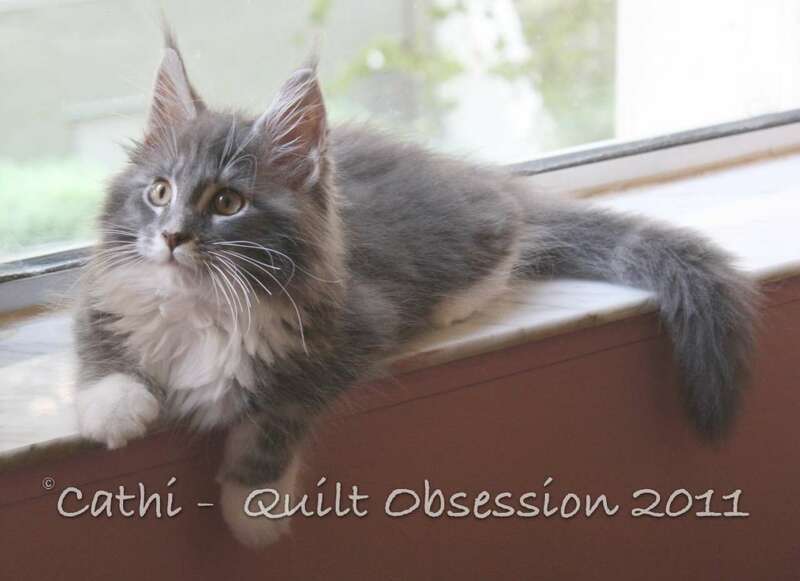 Gorgeous quilt and I love that Baxter has discovered the windowsill! 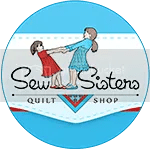 The sizes I make the most are somewhere around 40″x40″ for baby quilts and about 60″x80″ which I use as lap quilts (I like my feet covering!) or on my bed – perfect size for laying across the bed (over the duvet) and it’s easier to manhandle if it’s a warm night and I need to remove it! Beautiful quilt top Cathi 🙂 So pretty in pink and white. Must have been hard to just use two fabrics. Baxter looking ever so handsome on the window ledge. He seems to have settled right in there. In answer to your question, I have a tendancy to go no bigger than a lap sized quilt. It’s big enough to quilt on my own either by hand or preferably quickly and simply by machine.